Twin Ports residents your wait for Dickey's Barbecue Pit is officially over! Yes, rest assured that this news is 100% official and that you should probably take the necessary actions to obtain some delicious barbecue. Get in your vehicles and make your way to 4960 Miller Trunk Highway... right now. That's a command from us here at CDINDULUTH who currently are barbecue(less) as we are writing this post. Dickey's Barbecue Pit opened their doors this morning at 11am after almost two years of the chain promising a Twin Ports location. It's not current franchisees Landon and Sharon Wiser's fault. Oh no. In fact they saved your dreams of having a location near by that served up the delicious barbecue that the company is known for. We reported on the whole back story of this location last month and you can check out the article here. We had an exclusive first peek of the project upon its completion and are pretty sure we have included every photo your heart could desire below. The only thing we didn't include was the barbecue because that stuff is just too good that a photo wouldn't do it justice. You'll just have to stop by and experience it first hand. Below the photos we've also included a video that has a gift in it for you and your family. 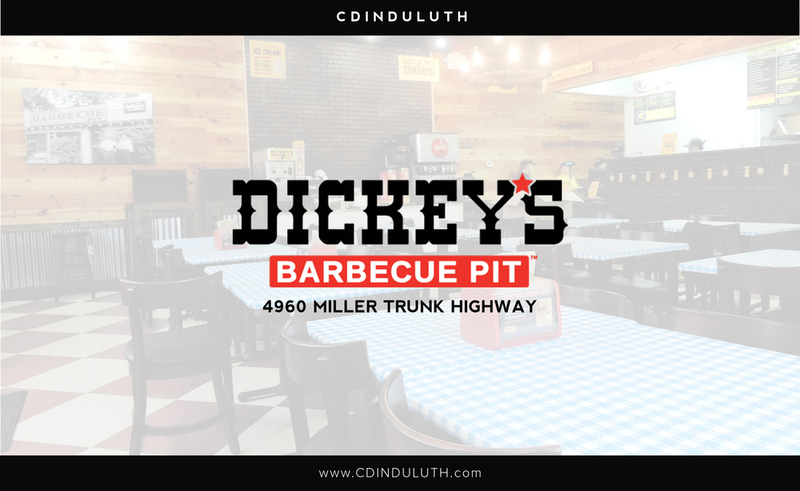 We were lucky enough to partner up with Dickey's Barbecue Pit to offer a coupon created just for our CDINDULUTH followers. Check it out below. We could not be happier for Landon and Sharon Wiser on the opening of their Dickey's Barbecue Pit franchise. It's been a joy to work with them over the past months and to see their restaurant come together. We think that with the neighboring Kwik Trip and the second phase of Sugar Maple Crossings along with the surrounding neighborhoods behind the restaurant that Dickey's and the Wiser duo will are bound to find great success. Welcome to the Twin Ports Dickey's Barbecue Pit. Watch the video below as we partnered with this great business on a gift just for you and your family. After watching the video visit here in order to access your gift.